Ravelry: Oddments pattern by Beverly S.
If you are an avid sock knitter, like me, then you have a ton of leftover sock yarn that is languishing in the stash. 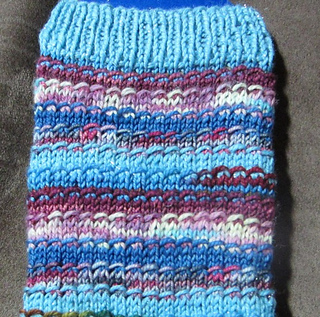 While I admired those who use their scraps to knit a sock yarn blanket, I knew I didn’t have the fortitude to finish one. So, I designed Oddments as a way to use up leftovers and still have a beautiful pair of socks! A wrapped stitch is used on every row you change yarns and this helps blend the colors together. Then three rows are knit plain which makes this a very simple knit. Chose as few or as many yarns as you like, but beware that if you use more than 3 or 4, you will have a multitude of ends to weave in. 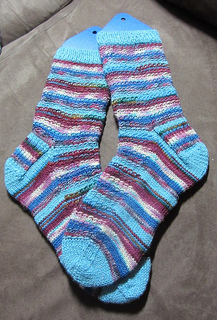 I used 6 yarns in the socks pictured which put the yarns about 2 inches apart – too far to carry. That left me with about 90 ends! As always, feel free to pm or email me for questions about the pattern. I’m happy to help if you get stuck! Thanks go to my test knitters: FatesLady, maggievanderstock, bmazanec, roocmc, and KWelch for your help making this pattern as error free as possible.